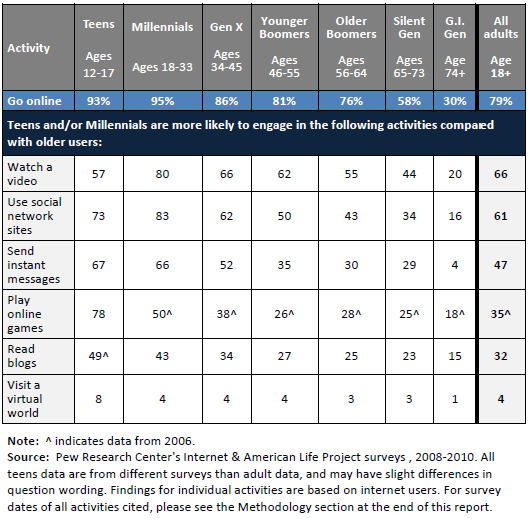 Younger internet users ages 12-33 remain the most active participants in the web’s social services. Seventy-three percent of teens and 83% of Millennials use social network sites, significantly more than older generations, especially adults over 55: While half of Younger Boomers use social network sites, only 16% of adults 74 and older have done so. Internet users under 30 are also significantly more likely to communicate via instant message, with roughly two-thirds of teens and Millennials sending and receiving instant messages. Internet users under age 34 are also significantly more likely to read blogs—49% of teens and 43% of Millennials do this. Teens, meanwhile, are by far the most likely to play online games: 78% play games online, the most popular activity for that age group. Teens are also the most likely group to visit a virtual world such as Second Life—8% of online teens, compared with 4% of internet users 18 and older. 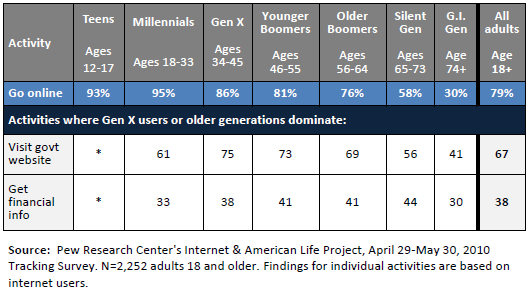 Older internet users are still more likely than younger generations to search for certain types of information online. Online adults ages 34-64 lead in visiting government websites—roughly seven in ten have done so—but younger internet users are catching up: 61% of Millennials have visited a government website, up from 55% in November 2008. Older generations are still more likely to go online for financial information, although here the Silent Generation leads with 44% of users ages 65-73 turning to the internet for financial information such as stock quotes or mortgage interest rates. A growing number of activities are becoming increasingly common across generations, though in many cases there are still large differences between the youngest and oldest cohorts. In addition to email and search, a strong majority (83%) of internet users have used the internet to search for health information, making this activity the third most popular for all online adults. Even among the oldest generation of internet users, the G.I. Generation, a majority purchase products, get news, and search for health information online. 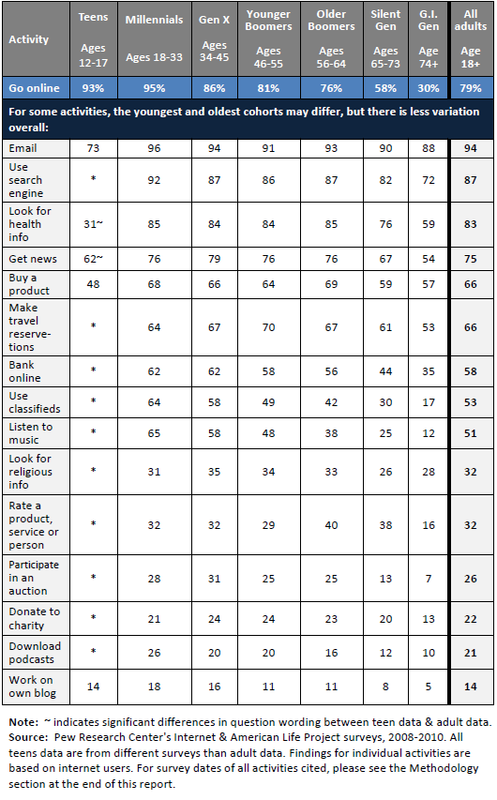 Internet users ages 56-73 are slightly more likely than younger adults to have rated a product, service, or person online, and are just as likely to have donated to charity online. Internet users ages 34-64 have lost their lead over Millennials in certain activities, such as buying products or banking online, as well as in searching for health or religious information. Other areas, such as blogging, were once the domain of teens and Millennials, but are now relatively common throughout most age groups. More information on survey dates and question wording is available in the Methodology section of this report.